We thought it would be fun to share the book with a global book tour. To accomplish this we we are in the process of launching 100 books from various locations across Canada and the USA at our Editors keynote presentations. Each book has a label and a tracking code so that readers who have the book shared with them can see where the book has traveled. 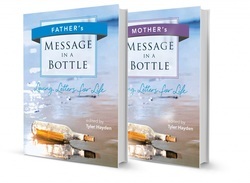 This is has proved to be a very cool way to reach new readers and share the messages from our Mother' and Father contributors. All the books are currently floating ... Maybe you will receive one on your next flight, cruise or other travel event.